Bon Secours St. Petersburg installed their first generator in 2011. A new state law is forcing them to install a second one on the other side of their campus for the assisted living facility. Months after Gov. Rick Scott approved new rules for nursing homes and assisted living facilities, much of the industry is not in compliance as hurricane season gets underway. In Pinellas County, Bon Secours St. Petersburg Health System’s campus hosts both a nursing home and assisted living facility. 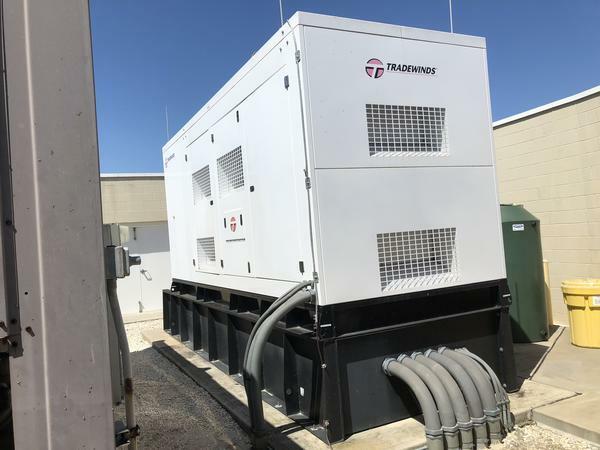 They got their 65,000-watt generator in 2011 for one side of the campus, but a new state law requires they install a back-up power system for those on assisted living too. Dan Finn is in charge of maintenance on the campus, and while he fires up the generator weekly and tests fuel regularly – among other maintenance – he’s now in the throes of hurricane season, when state officials are keeping an even closer eye on compliance. Last year, during Hurricane Irma, he and most the employees at Bon Secours St. Petersburg evacuated more than 300 residents. With the campus less than a mile from Tampa Bay, the Pinellas County Emergency Operations Center mandated evacuation. That same week in South Florida, another nursing home - one without a generator - saw 12 of its residents die when the air conditioning system failed, forcing them to live in sweltering conditions for three days. Soon after, Gov. Rick Scott pushed for mandatory backup power at nursing homes and assisted living facilities. Kip Corriveau, the Director of Mission at Bon Secours St. Petersburg, feels the mandate is a bit short-sighted. "I kind of feel like, with the governor's orders, is you had one tragic event. And that was the face of disaster preparedness,” Corriveau said. And it's proving tough for these facilities to carry out Scott's order. The state Agency for Health Care Administration reports that 102 nursing homes can meet the requirements and that 348 facilities have asked the state for more time. There are 686 nursing homes in Florida. The data is as of May 25, a week before the requirements took effect with the June 1 start of the 2018 hurricane season. Likewise, 205 assisted living facilities have proper equipment to meet the mandates. Another 344 are deemed in compliance because they have approved extensions or have submitted extensions. Six requests for extensions have been denied. Unlike nursing homes that will be able to offset the costs of equipment with Medicaid funding, there is no assistance for the 3,102 assisted living facilities in the state. The new rules also require facilities to keep enough fuel on hand to cool off a part of each facility for 96 hours at 81 degrees Fahrenheit. Corriveau said that's a big ask for some of the smaller facilities in Florida. "I don't know where they find the resources to be reimbursed because really none of this is reimbursable,” Corriveau said. He said Bon Secours is lucky to be part of a larger health care system that can pay for expensive generators, including the second one they’re installing because of the new law. Their first one, which is about the size of a small school bus, was $500,000, not including fuel and maintenance. But cost isn't the only problem. He said it takes time to get permits and order the equipment - not to mention everyone is trying to do it at the same time. "It's not that people don't want to comply,” Corriveau said. “It's that people who run nursing homes don't build generators, they don't have factories. They now are competing in a market with dozens of other folks in the same situation as they are." Kristen Knapp is a spokeswoman for the Florida Health Care Association, which represents most of the state's long-term care centers. She said the facilities she represents see generators as the first part of the solution to getting lights and air conditioners back on. "Hospitals get priority power,” Knapp said. “We'd like to see nursing homes just as important, up at the forefront there, when it comes to restoring power outages." Corriveau has a long list of things they think about during storms – and he wouldn’t necessarily put back-up power at the very top. "The generator issue is kind of low-hanging fruit,” Corriveau said. “It's a tangible thing, that I get. And I can understand, but there's so much more to this." Corriveau said his residents were evacuated on school buses during Hurricane Irma. The buses were ill-equipped to handle the residents, who are frail and sometimes suffering from dementia. Generator rules are a good start, he said, but, "we can make people do this and we can feel better and we think we've solved the problem. We haven't even begun to deal with the complexity of the problem." Corriveau said a solution needs to start at the local level - with focus groups and better emergency management partnerships - instead of with mandates from the top down.